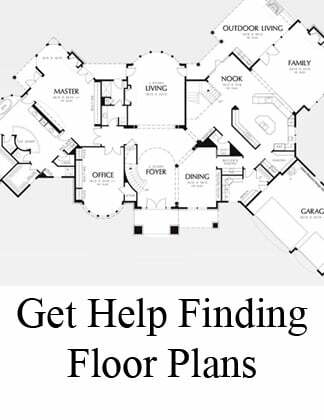 A popular home design request in North Carolina is for open concept floor plans that keep the staircase out of the foyer - and out of sight. 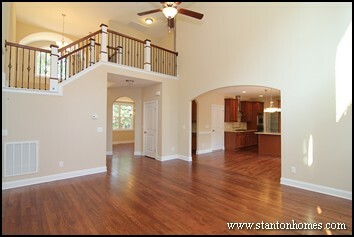 Below are examples of Raleigh custom homes with hidden staircases. 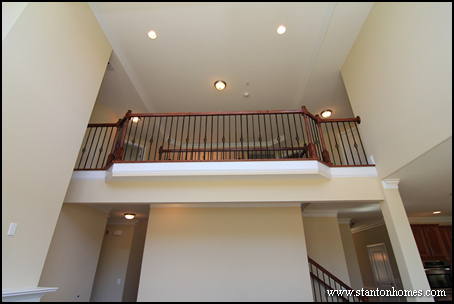 Want to keep your staircase completely out of sight? Take a look at this version of the Cannon. 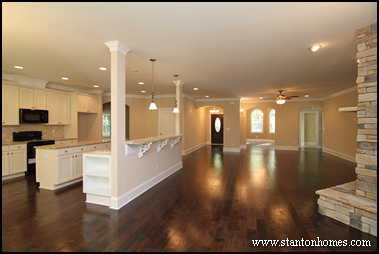 When you enter the Cannon foyer, your line of sight leads into the kitchen and great room. 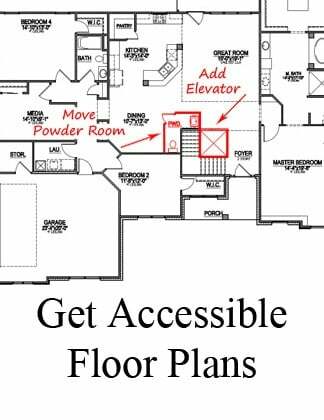 The staircase is tucked around a corner from the great room - see where in the floor plan image below. 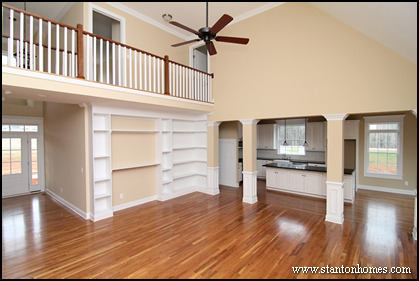 Do you love the open, inviting feel of second story overlooks? You can tuck the staircase to one side of the great room, and still have an overlook above. The staircase placement in this version of the Carwile - adjacent to the master bedroom - was designed for a couple with small children. 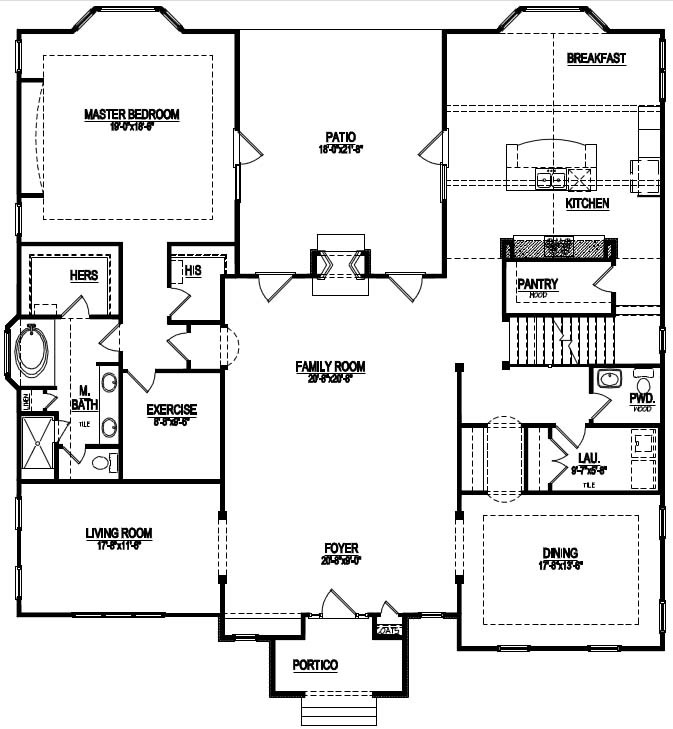 Their master bedroom has easy access to the second story bedrooms - but it is not located direct under those bedrooms, to minimize overhead noise. 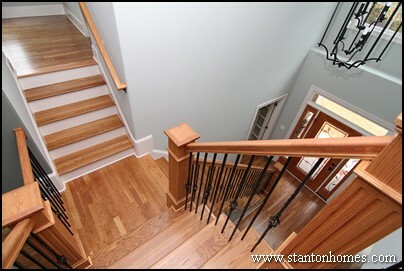 Many homeowners want their staircase completely out of sight, at least until they've walked past the foyer. This version of the Bryson is a great example. 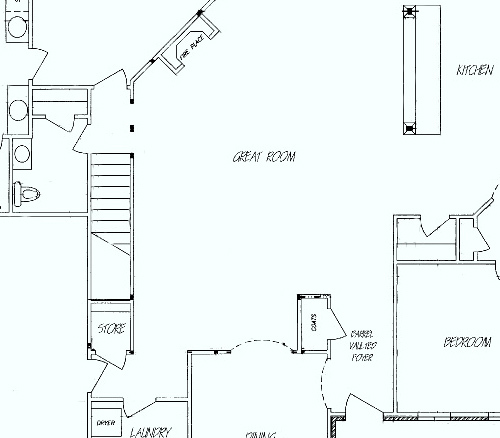 The staircase is tucked between the kitchen and formal dining room, near the mudroom and powder room. The stained hardwood steps and painted railings make a statement - while taking a backseat to the great room and kitchen design. 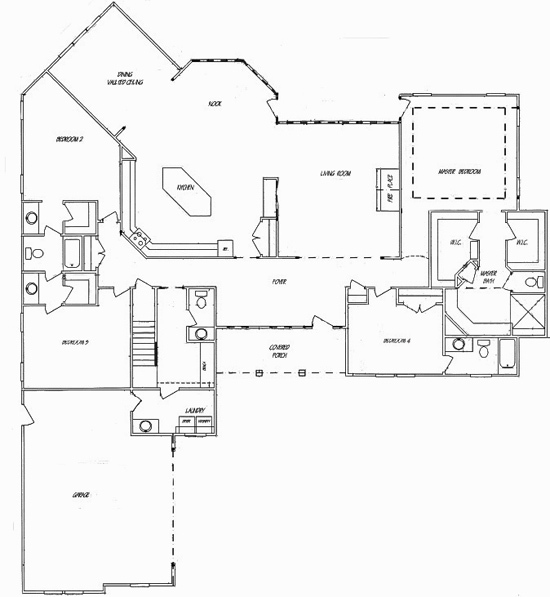 It is located centrallly in the home, roughly equal distance to the front door, garage, and rear patio entrances. It is also located far from the master - to minimize noise and maximize privacy. The Country Manor, an original Stanton Homes design, combines country home features with modern must haves - flexible spaces and open, free-flowing rooms. As you enter the Country Manor, the foyer flows into the oversized family room - where you can see directly through the two-sided fireplace and dual French doors into the courtyard patio. There are two staircases in this home, one to the basement and one to the second story. The staircase leading down to the basement is located down a corridor from the family room, out of sight from all major living areas. You’ve never seen a Lake House like this - with open concepts and upscale lodge style. Earthy, wood tones provide a natural highlight to everything from a plank ceiling in the living room to an enormous amount of storage in the large island kitchen. 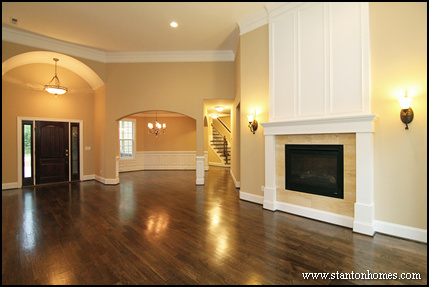 The foyer opens directly into the vaulted living room with full-height fireplace stone surround and built-in bookcases. The hidden staircase in the Lake House starts adjacent to the laundry room and drop zone, just steps away from the garage entrance. If you’re looking for the ultimate Mountain House, you’re going to love this home. In this one story home with second floor bonus, media, and bathroom, the barrel vaulted foyer opens into an elegant grand room with full-height wainscoting mantle above the see-through fireplace. The staircase remains hidden until you stand in the far corner of the grand room, facing the formal dining room. This home, a version of the Remington, features two other fireplaces (one in the master bedroom and one in the outdoor screen room), an island kitchen open to sunroom and breakfast room, and a lower patio with curved brick staircase. 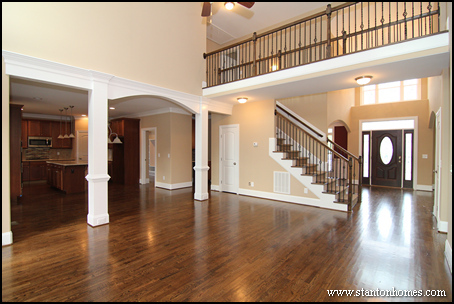 2014 new home staircase designs - see photos of two story overlooks, hardwood steps, wrought iron balusters, carpet runners, craftsman details, and curved designs. 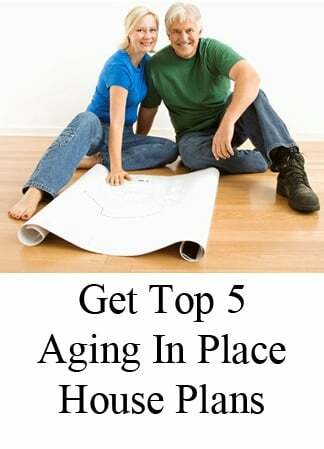 For two story floor plans, click here. Learn staircase design terminology: click here for post-to-post and over-the-post photos and descriptions. 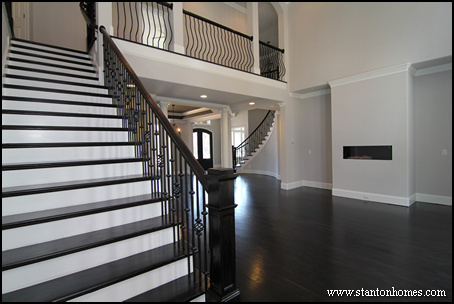 More staircase style trends: click here to read about staircase styles from traditional to craftsman. 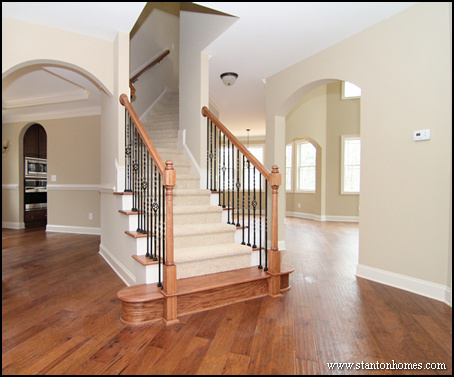 Below we've compiled photos of top staircase trends in Raleigh custom homes. 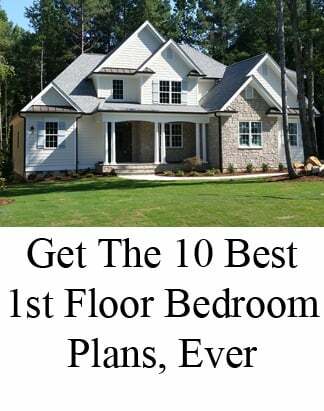 You will see more of these features, styles, and layouts in new homes, including: two story overlooks, hardwood steps, wrought iron balusters, carpet runners, craftsman details, and curved designs. Curved staircases add classic elegance to custom home designs. 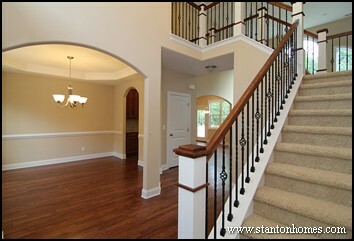 Including a balcony-style landing at the top of your curved staircase provides a space to formally greet your guests. From another angle, an additional staircase leading to the second story overlook is visible. 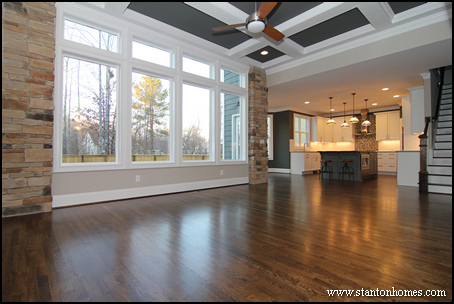 Get a cost estimate for this home - and view a full photo gallery - here. 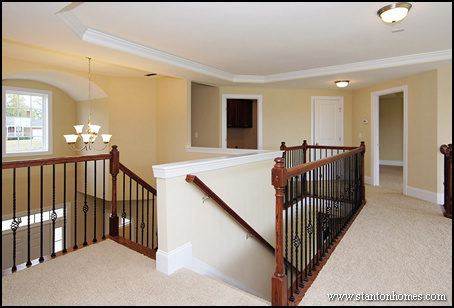 A staircase in the center of your home will facilitate comfortable traffic flow throughout the first floor. 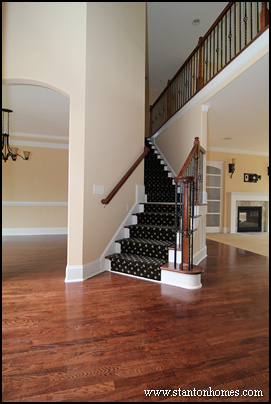 Consider adding a carpet runner, instead of just hardwood, to your staircase. A carpet runner is a great way to pull in a classic design or personal touch - in an unexpected space. Click here for more photos of this custom home - and see how much it costs to build. 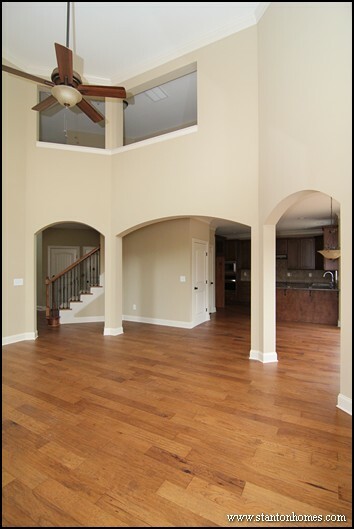 Creative lines of sight are a custom home builder specialty. First, this staircase design establishes clear, distinct space divisions between rooms - while maintaining an open concept design. Second, the staircase gives privacy to your breakfast area - blocking direct sight across the entire home. 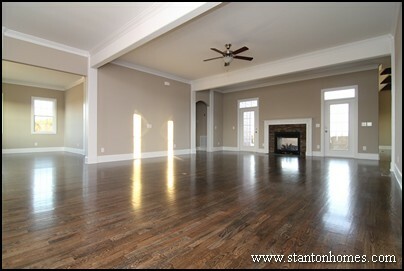 Third, it creates anticipation - and accentuates the drama - of your two story living room. Any time ceiling hight changes between rooms, the taller room will feel bigger and more striking. Click here to see more photos of this custom home. 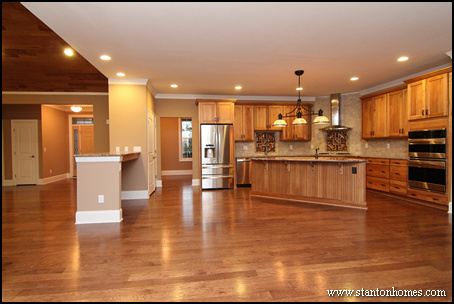 In this craftsman style custom home, the foyer opens into a hardwood staircase with bold, square newel posts. 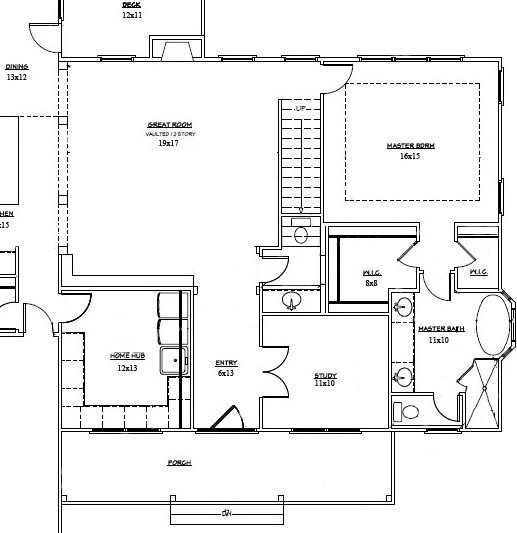 The landing splits into two directs - leading to a loft on one end and all bedrooms on the other end. 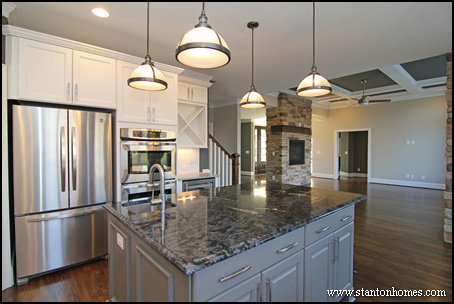 Click here for a full photo gallery of this custom home. 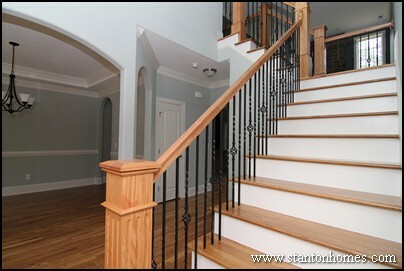 Here is another example of a staircase designed as the centerpiece of the first floor entrance. In this version of the Cove, a landing also leads two directions - with a loft to one side and bedrooms to the other. See a photo gallery of this home, here. In this version of the Kelley, two separate staircases lead to the second floor. 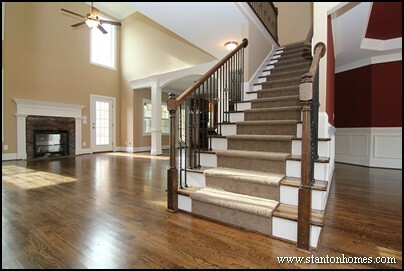 One staircase starts in the foyer; the other starts between the great room and kitchen. This places a staricase on each end of the home. A custom angled overlook gives two-sided excitement to this home. 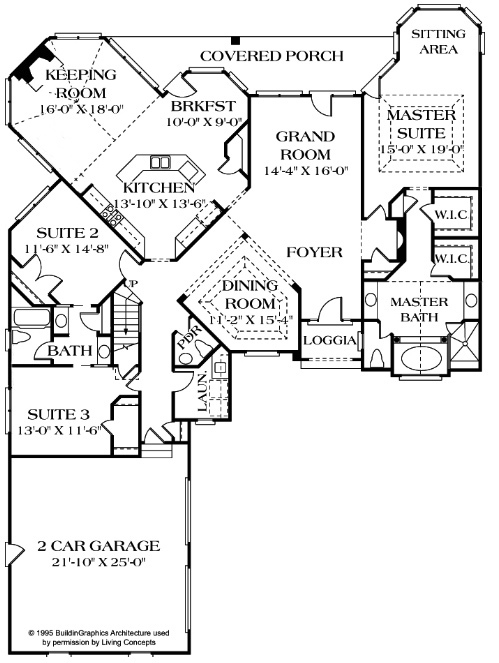 Click here to see a floor plan. 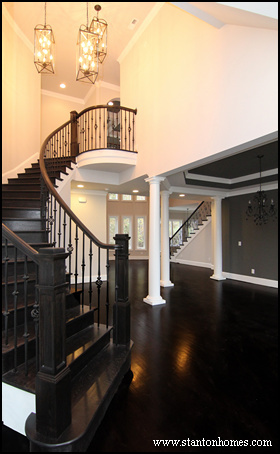 In this custom home example, the staircase runs perpendicular, rather than parallel, to the foyer entrance. This gives the staircase a central location - with side-to-side visibility, emphasizing a free-flowing design. 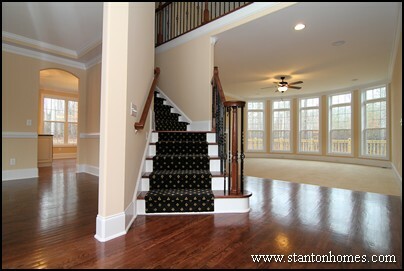 This staircase is another great example of how to integrate a carpet runner. Where do you want to make a big impact in your new home? Each staircase design example pictured in this article shows different ways to make a splash in your new home.